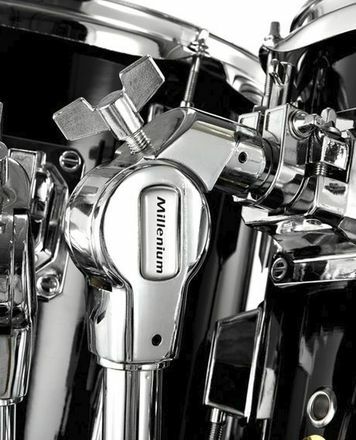 Industry standard hardware, loved by an infinite amount of touring drummers. If you have a roadie/tech/someone carrying your gear, DW stuff is perfect because it's so reliable and sturdy and so heavy! If you're not bothered about the aesthetics of the 3 legged stand, I'd definitely go for the 2. Just to save on weight as it is just as sturdy. This hi hat stand is on the weightier side but features a lot of classic innovative DW design. Great feel on the pedal that can have the tension adjusted (whether your a stomper or a heel toe rocker!). Clutch is solid. Memory lock means you get consistency setting up too. The only downside is if you're a touring drummer, the pedal can be a bit awkward to fold in on itself. Once you've loosed the 2 tension bolts at the bottom, the pedal folds up easily enough but when you want to unfold you have to pull hard down against the tension of the spring and kind of lock into place. That's why I use a 9000 on tour as the pedal base just folds up as if it's on a hinge. This is perfect set up in the studio though! ID: 101958 © 1996–2019 Thomann GmbH Thomann loves you, because you rock!